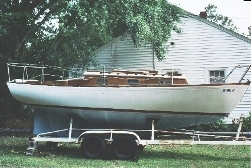 Winston bought Yankee #79, No Worries from Dave Dugan, Augusta, South Carolina in the Spring of 2007. 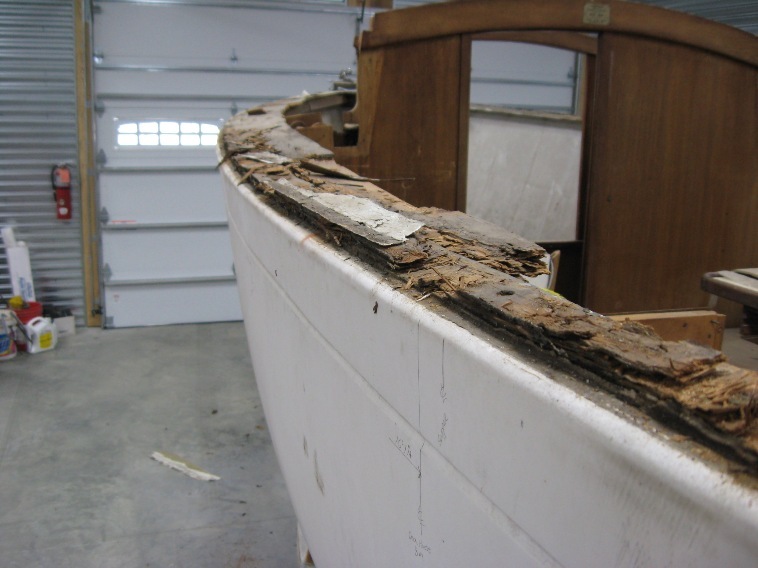 Dave had a lot of restoration plans for her that Winston will have to finish. We await a progress report from Winston but in the meantime below is a lot of stuff that Dave provided. 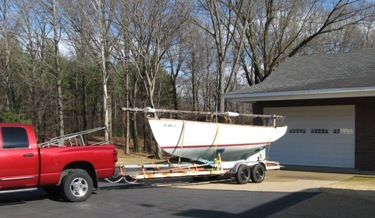 I am the proud new owner of Yankee Yachts Hull #79 which I purchased from Dave Dugan in March this year. 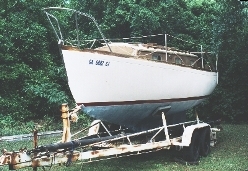 Dave sent me your Dolphin 24 web site info and I have enjoyed looking it over. I plan to submit my information to join the forum in the near future. 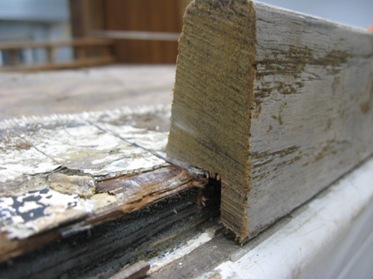 I have not started restoration as of yet (trying to get honey dooes off the table) but it looks like your site will provide much needed support. December 10, 2008. Winston Phillips and your webmaster exchanged emails and the following is an edited summary. 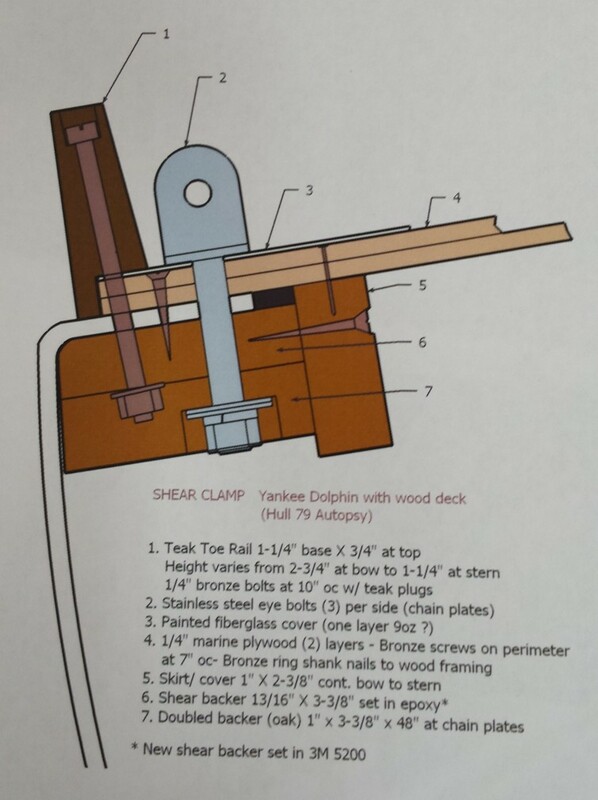 Some of this information might be useful to others with wood deck/cabin Dolphins. Thanks for checking on me. I haven’t been able to start work on this endeavor as yet, but intend to get started after the New Year. I do keep up with your post and other information that you so aptly provide. I like seeing pictures of the other Dolphins especially photos showing the cockpit areas. My progress so far only consists of sketching how I might construct the new deck and cockpit area. All the old cockpit framing, bulkheads, lockers, seating, comings, winch towers, bridge deck and etc. was removed prior to my purchase. This gives me a clean slate to configure as I would like, but not yet comfortable with how best to make these arrangements. Any input from you and the group would be appreciated. Also, check out http://www.dolphin24.org/teal_construction.html. 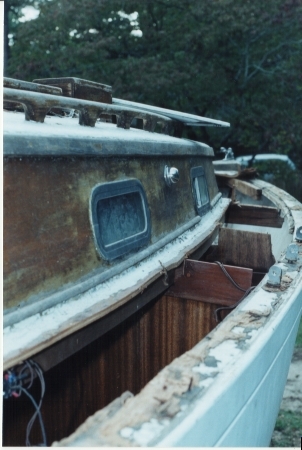 Teal was the original name of my boat and the guy who built her sent me some pictures taken during construction that might help. I'll take some more interior pictures, and the cockpit from the inside, trying to get shots of the framing so you see what was done. Maybe that will help. June 9, 2009. Winston sent in the following email. We have set up the link in the Stories Section as well. 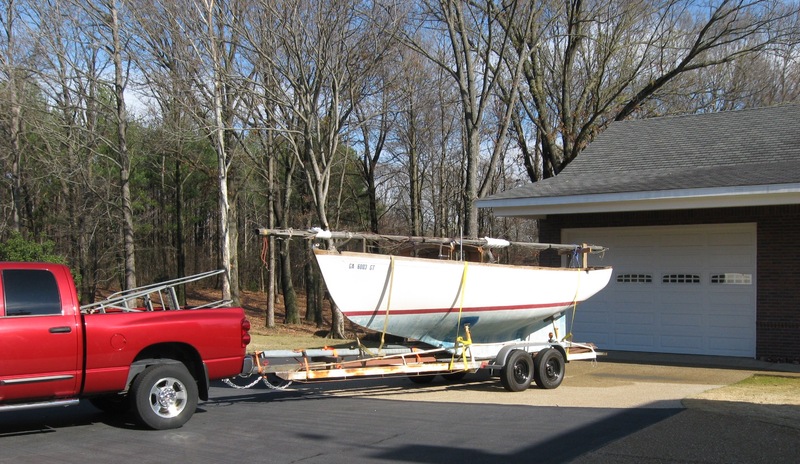 Not sure if you are aware of the solo sailing adventure by Capt. Tommy from Two Harbors, MN to Alaska via the Northwest Passage. I can’t remember where I saw the link to this, but it is very interesting. Thought you and other Dolphin sailors would enjoy. 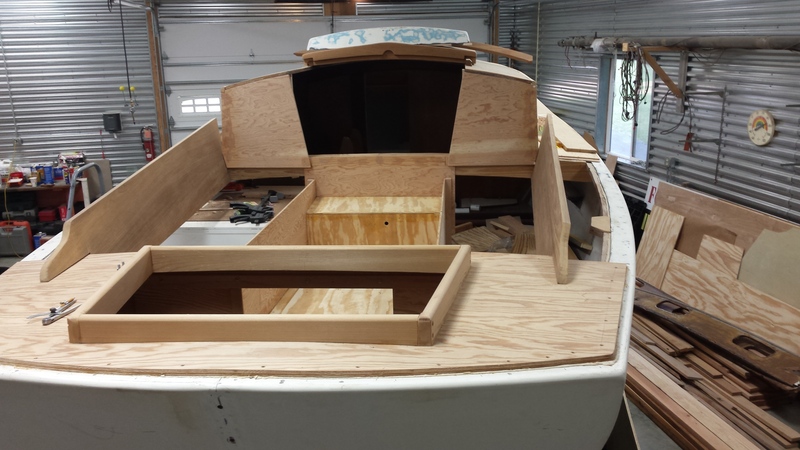 The link is www.articsolosail.com His Blog will take you back to the beginning and the almost daily posts will keep you up with the progress. 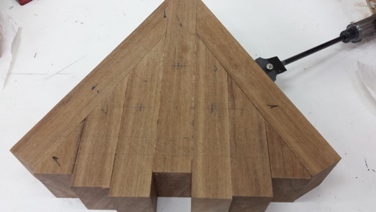 I don't have any news to report on restroration of 'No Worries' but I have built a new shop building for use in that purpose so will be spending more time in that endevor. Hope you continue to have a safe and enjoyable Maine excursion. Thanks for inquiry. I'm still here and visit your site often. I have made good progress for the time invested. The issue is staying on point. The Admiral says I'm a slacker (Ouch!) Attached are some photos along the journey. In the beginning my endeavor was to make all thing new but realized I would forfeit much originality. Since then I have repaired and reused whats possible and only replaced as needed. At some point I plan to organize small portions of the project pictures and get those to you. Let me know If you have any preference for that format (JPEG format). After exhaustive search of U.S. Coast Guard records and other applicable ship registries I could find no official recording of "No Worries". Further the "No Worries" placard or signage was ever placed on hull #79. Considering that, I feel somewhat safe in making this name change. The appropriate rituals and ceremony to follow upon completion. Please make name change to "Remnant" for Hull #79. Forward any required forms you require for this service. Webmaster Note: We considered forwarding the standard psychiatric questionaire but decided to waive pending satisfactory rituals and ceremony. I see you and Marionette had a fabulous year, congratulations on your successes. Hope 2017 will be as kind. You must have your hand on the Dolphin Community pulse and sensed I was restarting again some work on Remnant - other duties have prevented my intended efforts.... About a week ago I had a window of time and wanted to work on an item I could complete. 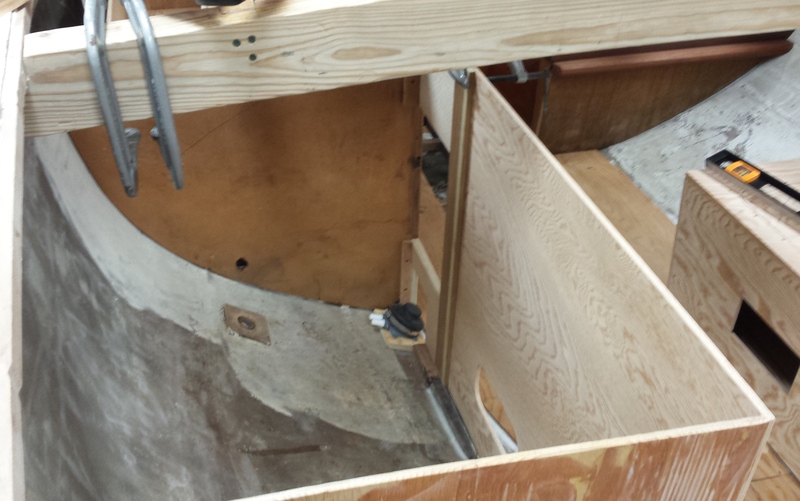 My next major step is tackling the cockpit area but that will require more attention than available now, so I wanted to proceed on fabrication of the new toe rail and bow assembly. 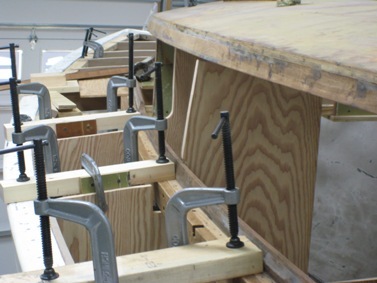 Obviously that would require verification of the original shear to deck construction along with several other items I needed to know for sure to avoid the expense of trial and error construction. Attached sketch shows the original shear and toe rail construction. 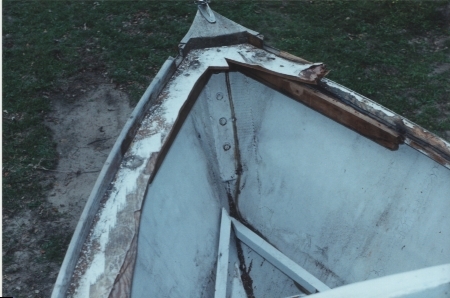 The bow deck framing was not part of original. 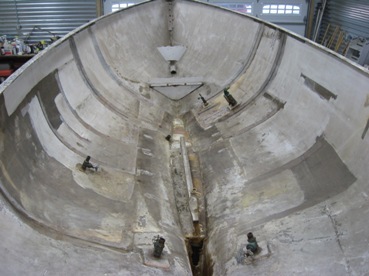 As far as I can see the 2 ply fore deck was self supporting. 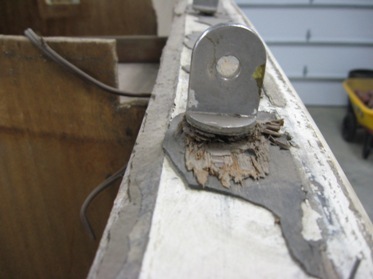 Also the stanchions were only partly supported by the shear with most of the bearing on the deck. I opted to add more support at their locations. 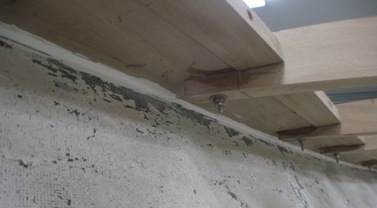 Also attached are several pictures of the original conditions and include some or the work completed thus far. You will see where I deviated from original. Now to the toe rail and bow assembly fabrication. 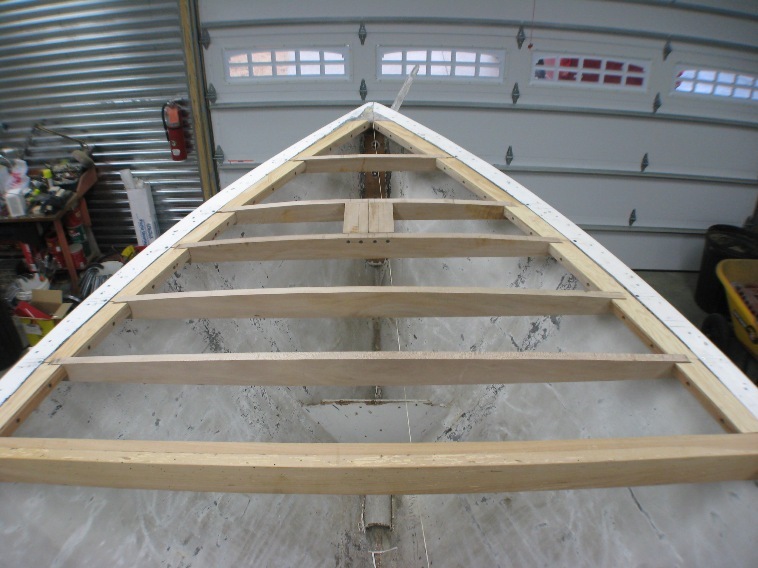 The bow assembly was fabricated from 3" thick stock. I don't have that so opted to build up from my 2" stock on hand. 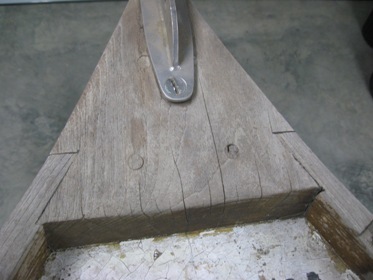 Photo of glued up bow piece awaiting completion. 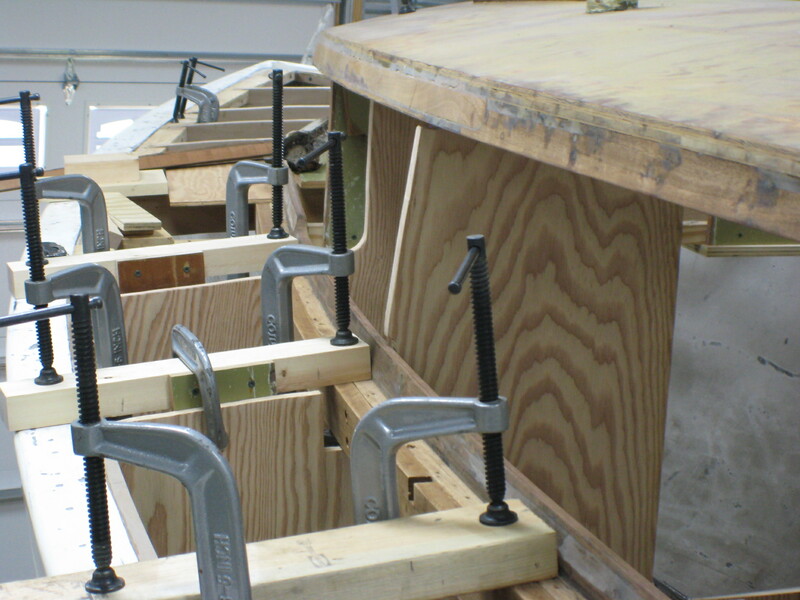 The fabrication and splicing of the toe rail is a challenge. 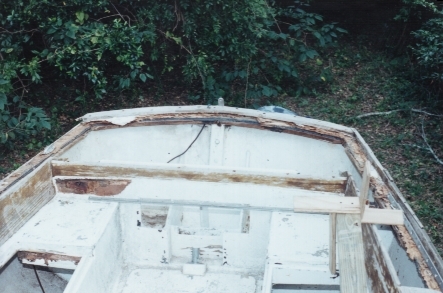 Original working stock was at least 14 ft with one main splice near midships. 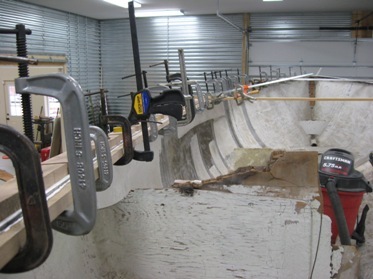 See photo of that splice, it is quite impressive and the fit up was perfect. May 12, 2017. As a Dolphin owner based in Tennessee we thought Winston would be an ideal candidate for the Ed Glover award, if we could get him and Remnant up to Camden, Maine for the Dolphin 24 New England Championships - alas, not this year. Here is his email. As you can see Remnant won't be participating this year unless the iron jenney is allowed. I understand from most accounts that the choice of elixir for the Ed Glover Award is worthy. Toured that distillery a few years back and remembered our guide saying that on every 4th or 5th Monday each employee received a pint of the finished product. You can guess that no one called in sick that day. Wishing all good fun and safety.